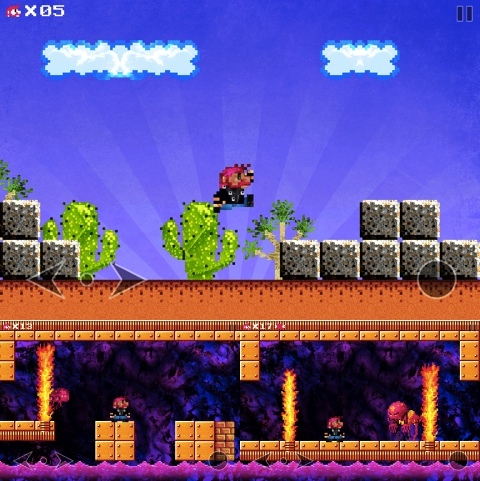 Awesome Land is an iPod Touch and iPhone app developed by FreakZone Games starring Manley, a character that looks suspiciously like Mario with magenta hair. Made by FreakZone, this application pays homage to retro platformer games by including many of the conventions of those classic games. This review was done using an iPod Touch and will detail all the aspects of the game to help you figure out if AWESOME Land is worth playing. The graphics in Awesome Land look like updated 16-bit graphics like from the older consoles. The backgrounds look very good, and perfectly fit the atmosphere of their specific level. All of the colors are very vibrant, and there happens to be a lot of purple, pink and magenta all over this game. 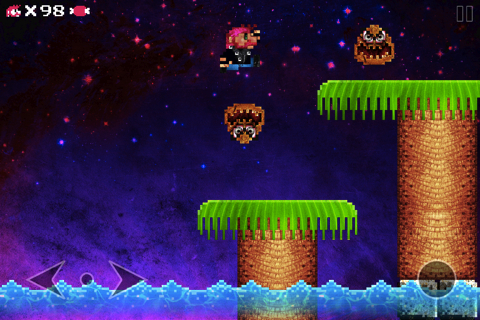 If you are into retro games, then you will appreciate this app on your iPhone. If you haven’t been exposed to too many retro games, then give this one a chance and see if you like it. The controls couldn’t be simpler. There is a directional pad to the left that lets you move left and right, and a button to the right that lets you jump. Upon inspection, the controls were very responsive and there appeared to be no lags from pushing the button and from Manley doing the action. Much like the graphics, the audio seems like it was ripped from the old retro games. For anyone who enjoyed playing classics like Mario and Sonic, the music is going to be very familiar. It never gets annoying, and you are sure to enjoy the audio. Much like Mario, Manley has to jump on his enemies to defeat them. Many of them look like Goombas (very, very angry Goombas) and other staple enemies from the Mario series. Unlike Mario, Manley doesn’t have the stomach for mushrooms. Instead, he goes after hunks of meat. It was a little disappointing to see that Manley didn’t get any larger when eating the meat, but he can’t be exactly like Mario, now can he? Awesome Land costs $1.99, and it is definitely worth trying out. While it is easy to draw parallels to Mario games, Awesome Land brings a fresh, new experience to this genre with innovative level designs and a whole new soundtrack. If you like anything retro, then you will definitely find this app amazing. While there are a lot of retro pretenders out there, Awesome Land only borrows from the older games, while building itself up into something new and different. While Manley and some level elements seem like they were ripped from Mario, you will find a lot of differences that will make this fun to play for hours and hours. AppSafari review of AWESOME Land was written by Darius Reimm on February 20th, 2012 and categorized under Action, Adventure, App Store, Fun, Games, iPad apps, Platformer, Universal. Page viewed 4073 times, 1 so far today. Need help on using these apps? Please read the Help Page.